This week’s power rankings are ready to roll. Duke is at Virginia on Saturday; get excited. 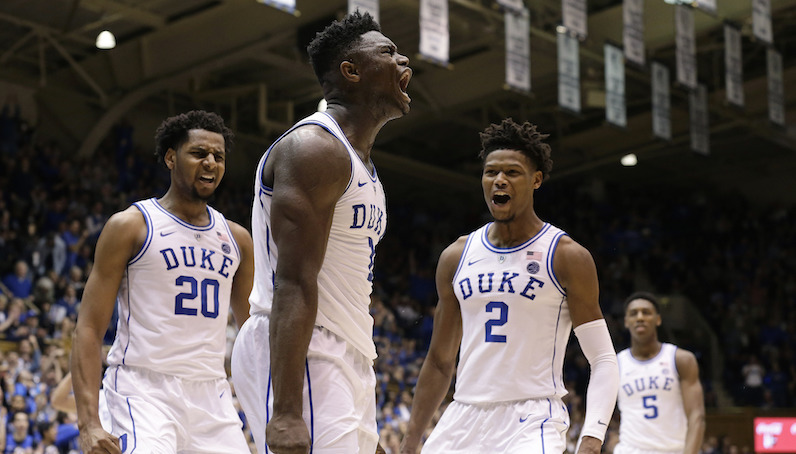 Before that, a look at a few different ACC Basketball topics: Zion Williamson runs wild (again), Cameron Johnson continues to sizzle from deep, Dwayne Sutton balls for Louisville and Virginia Tech tries to get by sans Justin Robinson. Duke was absolutely dominant in its home win over St. John’s on Saturday. Tre Jones eliminated Shamorie Ponds, Cam Reddish (4-of-10 3PA) played a wonderful two-way game, Marques Bolden was big and active and, of course, Zion Williamson did Zion Williamson things. Williamson scored 29 points on 17 field goal attempts (12-of-14 2PA), grabbed five steals and blocked two shots. He also had five dunks and is now shooting 79 percent at the rim (73 FG% in the half court at the basket). Once again, he continues to reaffirm his status as the best draft prospect since LeBron Freaking James, back in 2003. Let that sink in. It can’t be overstated just how much damage Jones (three steals) did to Ponds; he managed to make the act of bringing the ball up the court a misery. Ponds is a great player, but he had easily his worst game of the season: 3-of-11 FGA, five turnovers. According to Synergy Sports, Ponds was a combined 1-of-6 from the field with Jones as the primary defender. Also: The Tre Jones-Zion Williamson two-man wrecking crew — defense to fast break — was in full flight, too. This is one of the most exciting plays/sequences in all of sports. Without Ty Jerome on Saturday, Virginia put forth one of its worst offensive performances of the season. The Cavs turned the ball over 14 times (23.8 percent turnover rate) and scored just 0.95 points per possession (48.1 eFG%). Kihei Clark dished out six assists, which is great, but he also had six turnovers, too. When it needed a score, though, Virginia turned to Ol’ Reliable: De’Andre Hunter. Hunter continues to flash an efficient mid-post face-up game. This is the type of bucket-getter that gives Virginia a serious edge in leverage moments. All that said, Virginia still held firm on its home floor and beat Miami, 56-46, the ninth time this season UVA has limited an opponent to under 50 points in a game. Hunter, of course, did his thing, and Mamadi Diakite continues to find his footing on both ends of the floor: 11 points, five offensive rebounds and three blocks. Diakite has a block rate of 12.1 percent in ACC play, which is tops in the conference. From the win over Miami, this was the play of the game from Virginia — defense to offense in a flash. The recovery from Hunter is outstanding, and it results in an easy finish for Braxton Key, who was also solid again. No surprise, North Carolina got outstanding production from one of the league’s elder statesmen last week. In road wins over Georgia Tech and Louisville, Cam Johnson continued to rip nets — scoring 41 combined points on 19 FGA (7-of-12 3PA). Johnson moves so well without the ball. Watch Luke Maye throw Johnson open here — tossing the pass into a wide open corner. Johnson tracks it down and quickly gets into his shooting motion. This is some Diet Klay Thompson-type stuff. About half of Johnson’s shots from the floor this season have come from beyond the arc: 53-of-11 3PA (47.7 3P%). After 47 games in a UNC uniform, Johnson in the midst of some elite company. Also: I very much enjoyed Coby White going all Dirk Nowitzki for a possession on Saturday, too. Lost amid the ridiculousness of NC State’s disaster offensive performance on Saturday: Virginia Tech’s struggles on offense, too. The Hokies have a star in guard Nickeil Alexander-Walker, and there are things this team can do to adjust without Justin Robinson, but Tech needs its senior lefty back. In Raleigh, Tech scored just 0.89 points per possession and posted an effective shooting rate of 43.3 percent. Both rank as the team’s second worst performances of the season. It was also Virginia Tech’s slowest game of the year — a snail-like 53 possessions, per Sports Reference. According to Synergy Sports, Tech ranks No. 1 nationally in spot-up efficiency: 1.21 points per possession (63.2 eFG%). Against NC State, however, the Hokies went just 4-of-13 on spot-up attempts (30.7 FG%) and recorded more turnovers (12 total, 22.6 percent turnover rate) than assists (8). Man, Dwayne Sutton just keeps getting better and better. Even in defeat, he was excellent against UNC. Sutton is a smart, poised player with good physical tools. For Louisville, he impacts the game in ways that show up in the box score and outside of it, too. Sutton has been on the floor for 82 percent of Louisville’s minutes in ACC play, and features an effective shooting rate of 59.3 percent in conference action — No. 6 in the league. Sutton is a solid 3-point shooter (37.8 3P%), especially off the catch (60.7 eFG%, per Synergy). He gets his looks in the flow of the game. It has to be fun to play with and coach this guy. Louisville will run a simple pick-and-roll with Christen Cunningham and use Sutton as a secondary option — alongside the rolling big man. When the defense reacts to the roll, Sutton turns online as a terrific second-side player: 1.08 points per possession (57.4 eFG%) on spot-up possessions. He’s also shooting over 62 percent at the rim in the half court. His development is one of the coolest stories in college hoops. Florida State has played just three games over the last two weeks, but as the schedule has lightened up, the Seminoles have taken down all opponents: Clemson, Miami and Georgia Tech. This FSU team won’t win any glamour awards; they rank 226th nationally in 3-point percentage (33 3P%) and 3-point attempt rate (36.8 percent), per KenPom. After missing lots of game time this season with a foot injury, Phil Cofer — who has played in just nine of FSU’s 21 games — just can’t get right. It’s a bummer; this is one of the best stretch bigs in the league. Cofer played a combined 39 minutes against Miami and Georgia Tech (2-of-4 3PA), but scored just nine points on nine shots. His usage rate is down to 17.2 percent in ACC action. However, Florida State is up to No. 22 in weighted defensive efficiency; in Atlanta, Georgia Tech was held to under 0.74 points per possessions. Also, one of our favorites, Trent Forrest (2.7 steals per 40 minutes), continues to cause havoc. Last week was a tough one for Kevin Keatts and the Pack. After a narrow overtime defeat to No. 3 Virginia, State collapsed at home against Virginia Tech. NC State scored just 24 points and a once powerful offense was reduced to rubble. The Pack went just 2-of-28 on 3-point attempts (7.1 3P%) and attempted only six free throws. As a team, State scored a measly 0.45 points per possession. Can State put this performance behind them as some sort of twisted joke from the Almighty Basketball Gods? A short attention span is a must as the Pack travels to Chapel Hill for a matchup with the Heels on Tuesday. 6. This team is going to play hard on defense. They are going to give themselves a chance every night because of that. 7. They also don’t have enough shooters/scorers. Markell Johnson is a great player but the 50% 3pt shooting he had early in year was a touch of an outlier. Road wins can be hard to come by in the ACC, and Syracuse bagged two of them last week. Winning at Boston College and Pittsburgh won’t exactly vault you up these power rankings, but this team finally got some positive outings from Frank Howard. Offensively, this team just isn’t very good; it’s hard to think of one reliable thing it does well other than watch Tyus Battle impersonate 2005-06 Kobe Bryant. In last week’s wins, though, Howard went a combined 4-of-11 on 3-point attempts, and snagged four steals in the win over Pitt. He also may have dodged a serious late-game blunder in the Pitt win, too. Syracuse’s defense can make any opponent look bad, and that’s exactly what this team needs to continuously hang its hat on. The Orange have an identity on that end of the floor. Things had to turn around for Clemson, and the schedule played a pivotal role, too. Clemson remained at home for both games last week — wins over Pitt and Wake Forest. The offense looked great against the Panthers — 1.26 points per possession, 40 combined points from Marquise Reed and Shelton Mitchell (4-of-4 3PA). Then on Sunday, Clemson eviscerated Wake Forest. The Tigers held Danny Manning’s bunch to 0.6 points per possession and sub-24 percent shooting from the field. Clemson's on a 15-2 run since the break, separating itself with some nice momentum. Tigers needed this kind of play after such a rough stretch to open conference play. Pittsburgh has dropped five straight games (2-7 ACC) and is 13th in the ACC in adjusted offensive efficiency since the start of league play. With an effective shooting rate of only 44.4 percent (29.9 3P%) in ACC action, Pitt just isn’t hitting enough shots. Xavier Johnson continues to be a fun driver of the offense, though. With Johnson leading the charge (8.1 FTA per 40 minutes), Pitt ranks No. 9 nationally in free throw attempt rate: 43.8 percent. According to Synergy, he’s drawn a shooting foul on 26 percent of his isolation possessions. I obviously have a soft spot for the throwback post game of Abdoulaye Gueye. But this Tech team doesn’t have anything close to resembling an ACC-level offense. Scoring has never been a strong suit for the Yellow Jackets under Josh Pastner, but in nine ACC games, Tech has scored under one point per possession seven times. According to KenPom, this team is on pace to be the worst offense of Pastner’s stint in the ATL: No. 265 in adjusted offensive efficiency (98.9). On Saturday against Boston College, Notre Dame had an offensive performance reminiscent of what we’ve seen from the Irish in recent years. Notre Dame splashed 10 3-pointers and scored over 1.2 points per possession. Four starters, led by Nikola Djogo (21 points, 4-of-6 3PA), scored 15+ points. John Mooney continued to perform excellently, too. The stretch big, who has All-ACC honors on his horizon, scored 15 points, grabbed 13 rebounds and recorded zero turnovers. Mooney now has 14 double-doubles this season; he ranks top 10 nationally in defensive rebound rate: 30 percent. In ACC play, that’s jumped to 32.6 percent, which is tops in the league. It was a total power outage for an undermanned Miami team at Virginia — to the surprise of no one. Despite the team’s struggles, Chris Lykes continues to deliver. He’s one of the ACC’s best at shooting off the dribble and out of the pick-and-roll; however, it’s been interesting to watch Miami move Lykes off the ball — as a means to get him higher-percentage looks and avoid ball-screen traps. Chris Lykes big 3 before halftime has @CanesHoops amazingly only down 7 as 2H is about to start. Canes shot 28 percent in the first half. Can the Hurricanes get one at home this week against Notre Dame? KenPom gives Miami a 60 percent chance, currently, of a win, which would halt a five-game losing streak. Ky Bowman continues to try and be Boston College’s Iron Man. Bowman (39 minutes per game) basically never leaves the floor for the Eagles. In fact, Bowman has been on the court for 99.4 percent of BC’s minutes in ACC play. Boston College has played eight league games (2-6 ACC), and Bowman has logged 40 minutes in seven of those contests. He played 38 minutes in the loss to Virginia. Bowman has been everything for BC (27 percent usage rate, 56.6 TS%); Jordan Chatman (39.3 3P% in ACC play) has been better recently, too. Unfortunately, this team just isn’t equipped to deal with the loss of Jerome Robinson. Things don’t get easier, either. This week, BC travels to Duke and Syracuse. Gulp. Another week, another set of disheartening performances from Danny Manning and Wake Forest. I’m not sure what else to say, other than to repeat the phrase: this program is rudderless. As you could guess, things went poorly at Clemson — with Wake falling 64-37. Last week, Wake Forest was outscored in defeats to Louisville and Clemson by 57 combined points. Clemson beats Wake Forest 64-37. Season-low in points for WF, which shot 14-for-59 (23.7 percent, 5th-worst in program history). Deacs fall to 8-13, 1-8. Quick turnaround to play Pitt at home #onaTuesday. A major problem for Wake Forest: the struggles of guard Brandon Childress. One of the few bright spots for Wake this season, Childress has landed in the gutter over the last two weeks. He’s now playing over 36 minutes per game in ACC play, too. Will Danny Manning survive the week as Wake Forest’s basketball coach?